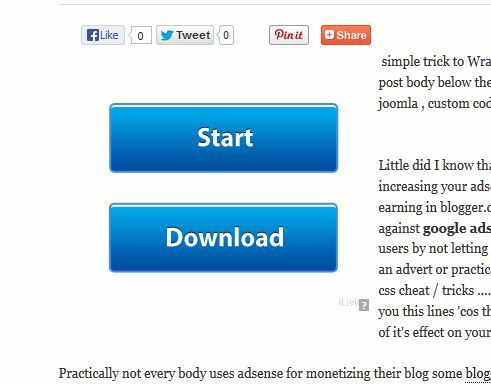 This is my little 2013 simple trick on Wrapping google adsense / other ads code around your post body, below the title in blogger , wordpress , smf , joomla , custom coded sites & other cms websites without attracting a ban. Little did I know that this legal tricks works like hell for increasing your adsense / any order ads networks service earning in blogger.com blog or similar blog services . It is against google adsence terms and services to fool your users by not letting them know that what you have in there is an advert or practically hiding the “ads by google” link via css cheat / tricks ….. black hat adsence gurus may not tell you this lines ‘cos they wanna sell their books irrespective of it’s effect on your adsense account . Practically not every body uses adsense for monetizing their blog some bloggers that targets mobile users uses only admob why majority of other bloggers uses other popular adnetworks like media.net yahoo bing ads services , bidvertiser.com ,chitka.com , addynamo.com , clickads.com and snowmotion. which explains my reason for not tagging this article for adsense alone . First you already know the ads service that best works for you. log in to your ads provider’s dashboard ==> from the publisher’s session and create any adds format of your choice . For the purpose of this tutorial on wrapping your ads within your post body only or just below the post title of the single post in your blog we will be dealing with most popular and always converting ads format like 180*200 , 200*200 , 250*250, 300*250 , 336*280 ads format since they suits best for this position (under post title wrapped around post body) . var x = document.getElementById('tarea'); x.value = '\nPaste (or write) here your code\n\nConverts\n < " & \' >\nto\n < " & ' >'; x.rows = gr; // ]]>Remember to replace your notepad (notepad 1) content with this new add code you 've gotten after parsing the code for us to now have notepad 2 (parsed advert code)'cos that's what we are gonna use in the preceding steps …. wordpress: just copy your preferred ads format preferably 300*250 and paste it under “post title ” using “quick adsense plugin” or wrap around the body with same plugin too . Genesis and thesis or even some premium themes users do not need any plugin to add their code simply use the integrated adds option that comes with your premium theme under theme options or use simple hooks for the genesis framework . Save your settings to have your ads up and running . Pay keen attention to this very part. The tutorial you have just read was an old trick I have written long ago, It shouldn’t just work like that now that google bans adsense account mercilessly without giving you a choice. you can change the advertisement title to any one of your choice, then replace the other one with your advert code. N/b it is only google adsense that has this strict rules, you can simply remove the first paragraph for other ads publishing services. I will try it with my media.net ads, I scared if using Adsense. Thank you for sharing. Thanks for this. I will book mark this page and use it in a couple of days. My friend,I am back to say thanks. The quick adsense worked like a charm. I was using advertisement management but after trying the quick adsense, I had to trash that one.